Kalise is an ice cream manufacturer headquartered in Spain, primarily selling their novelties in Spain and Mallorca, but apparently also in France, which is where I discovered them, when visiting my office there. One of my favorite parts of visiting offices worldwide is exploring their ice cream freezers, like Heartbrand ice creams in Munich, Mövenpick in Zurich, Streets in Australia, Nestlé in Canada, Hood on the east coast, and regional offerings from Ben & Jerry's in Munich). Kalise is the Ice Cream from the Islands, the ice cream that accompanies you through your day and gives you space to let your imagination fly. It's waiting for you in kiosks and bars because it wants to stroll along the streets with you. In different formats, flavours and shapes, so that everyone can find something they like. It makes us so happy to see how you enjoy them that, every day, we keep on innovating, making sure that we offer you the best quality and the best service. The items I tried were all bars, part of the Tarufo Plus line. Tarufo Plus comes in a slew of varieties: White, Coconut, Almond, Black Jack, and Raspberry. They were ... well, generic ice cream novelties. I started with the blanco, which seemed to be vanilla ice cream coated with white chocolate. 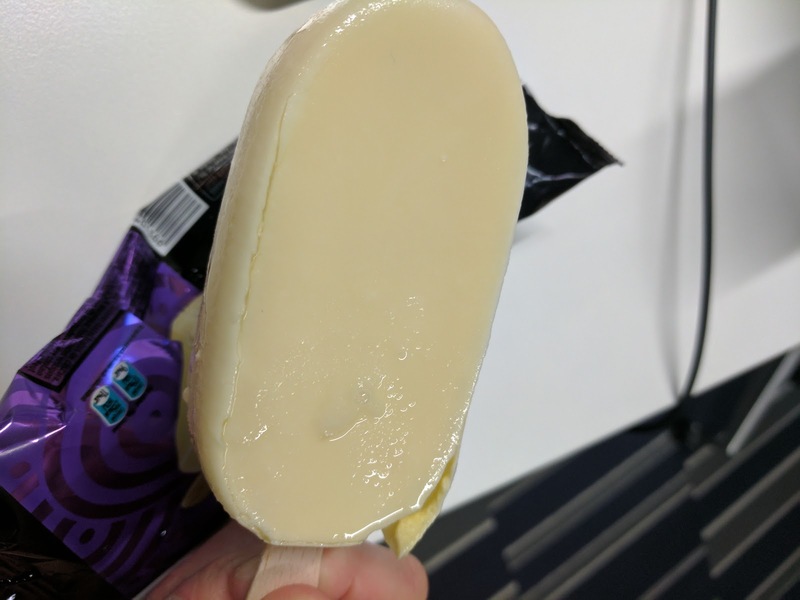 Unfortunately, it was pretty freezer burned when I got it, so, I can't really evaluate the quality of the ice cream itself. The white chocolate shell though was sweet, creamy, and had a nice snap to it. It wasn't crappy white chocolate. 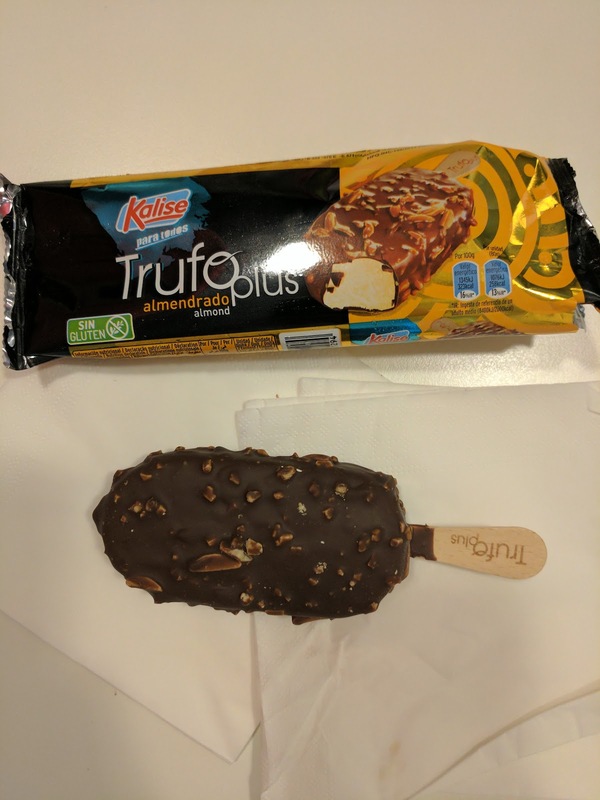 I moved on to the Trufo Plus Almendrado, another base of vanilla ice cream, this time coated in milk chocolate with bits of almond. This one wasn't freezer burned, but, the ice cream was very generic vanilla ice cream. The milk chocolate shell was equally unoriginal, just standard, fairly low end, waxy milk chocolate. I liked the crunch from the bits of almonds. That is all I have to say. It takes a lot to impress me with a sweet treat these days. I'm spoiled, I eat a ton of desserts, and baked goods in particular. The pastry chefs at my office are insanely talented and I'm treated to about 4 different amazing dessert creations ... every single day. I seek out great desserts when I'm not at the office. And you can kinda guess what I spent my time in Paris doing ... yes, visiting as many bakeries and patisseries as I possibly could. Let's just say that my sugar, butter, and carb consumption was at an all time high, which is impressive, given how many desserts I eat in "normal" life. But I digress. I haven't even started telling you about the amazingness that awaits at Pâtisserie Chocolaterie Pralus. Which I'll do. But, if you want the short version: go to Paris (or Lyon, where they also have a shop). Get a Praluline. Actually, get a few. Save one for breakfast. Bring one back for me. Or take the easy route, and order online. Yes, they ship worldwide. Thank me later. You are welcome. 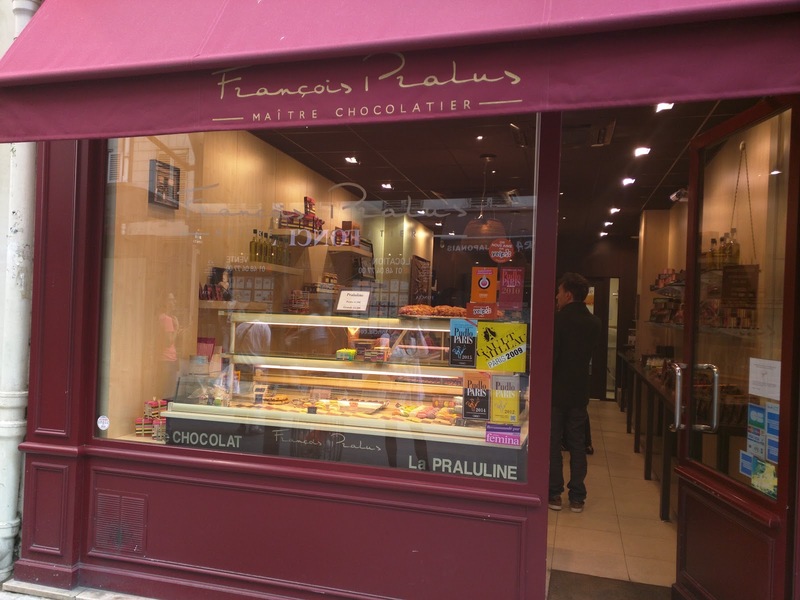 First, Pâtisserie Chocolaterie Pralus is actually mostly a chocolate shop, with master chocolatier François Pralus at the helm. 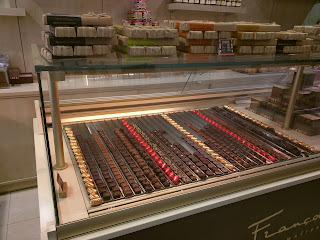 When you enter the shop, the large front counter display is filled with individual chocolates, plus large bars on top. Apparently the chocolates are quite good, but that is not what I was there for, and I honestly didn't even stop to look at them. The wall behind houses assorted chocolate confections, packaged up to go. I almost stopped to browse this area to get something else to take back with me, but I had my eyes set on my prize. The further wall contained some assorted jams. Clearly not what I was there for. No, what I was there for wasn't really on display, besides a tray in the font window, and a platter behind the counter where you order. 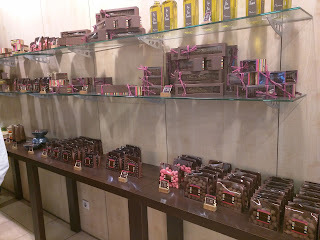 Again, this IS a chocolate shop after all, so 95% of the shop is occupied by chocolate and other confections. It took a while for me to be able to take a photo of the storefront, without gawkers in the photo. The number of people who walked by, saw the platter, and stood staring was a bit amazing. Let's just say that I wasn't the only one with a camera out. So what were we gawking at? Pralulines! The look on this guy's face really does sum it up. That cleared it up, right? Pralulines are an amazing creation by Auguste Pralus (father of the aforementioned chocolatier François Pralus). 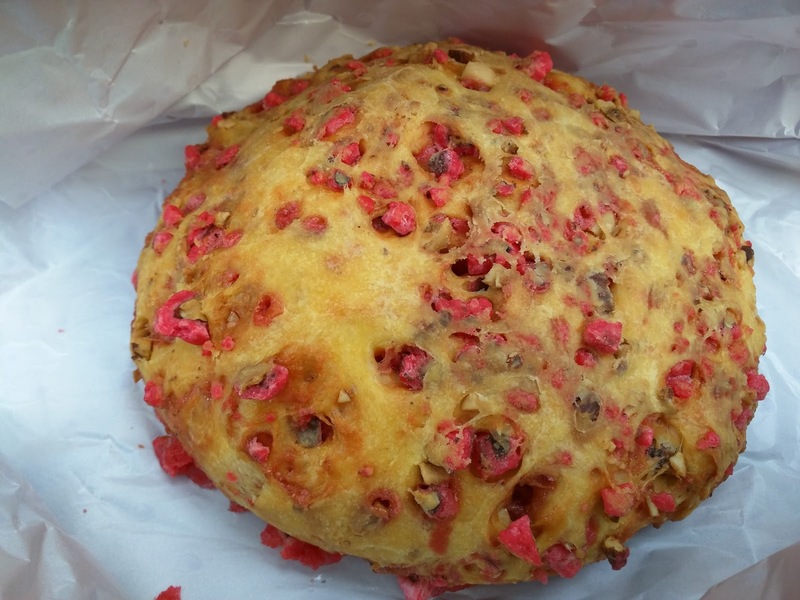 A simple description is that it is a praline bread, but, that doesn't do it any justice. First, it looked nothing like any other praline bread I've ever seen. 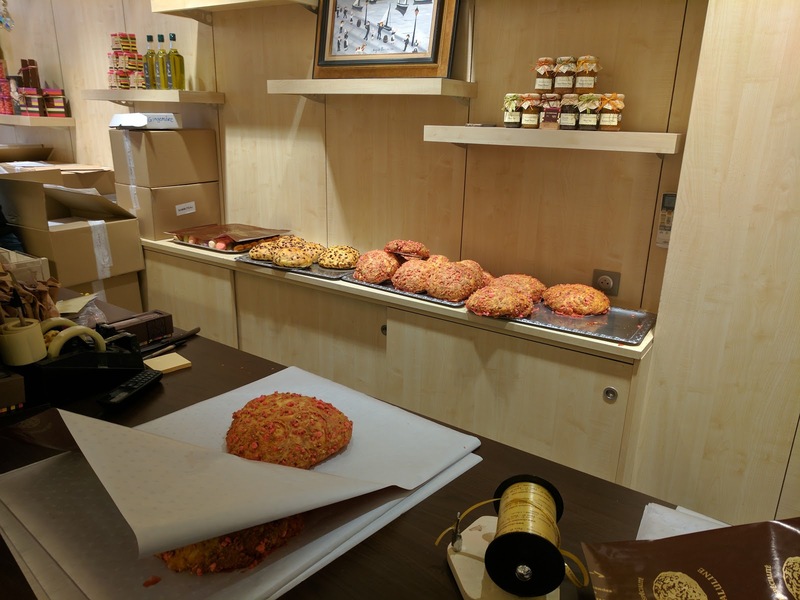 Now, to be honest, I had never heard of praline bread before I got to Paris, but they were a fairly common item at bakeries around town, like Liberté. The others are all inspired by the Praluline, but none are said to compare. And, at least on looks alone, they clearly don't. The one from Liberté was a small roll for example. The one from Pâtisserie Chocolaterie Pralus was ... not. But I get ahead of myself. Let's talk more about the Praluline. Auguste Pralus was a pastry chef. A rather accomplished pastry chef at this point, but he created the Praluline in 1950 when he was just a baker somewhere (yes, this thing has been around for 60 years). He subsequently won many awards, chaired many important pastry and culinary boards in France, and even received the French Order of Nation Merit. I see why. Quite frankly, the Praluline is the only thing I ate in Paris that not only lived up to its hype, it surpassed it. 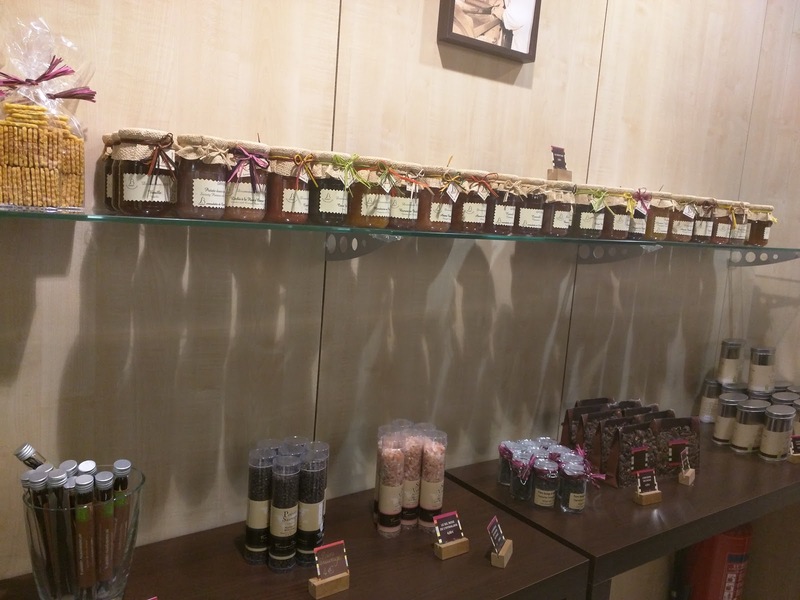 On Saturdays, they sell more than 800 Pralulines at a single shop. Again, I see why. Pralulines are baked on site, continuously, all day long in a tiny little area in the back of the store. 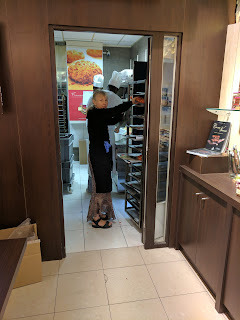 When I was there, I saw a worker kneading dough, and fresh pralulines were lined up on baking racks right inside the doorway. These things come out fresh. Pralulines all lined up and ready for packaging. Since I've been reviewing all the packaging at different pastry shops, I'll continue that theme here as well. I ordered from a person behind a counter, who grabbed a Praluline, wrapped it in a wax paper-ish wrapper that was already laid out, tied it with a ribbon, and passed it down to the cashier. The cashier quickly rang me up, placed it into a brightly colored bag, and handed it over. The packaging was only slightly annoying. Better than some of the fancy boxes I encountered like at Pierre Herme, but still a bit hard to deal with. I wanted to break into it right away, and the ribbon made that difficult! Since the shop is just a small chocolate shop, they do not have any seating. I couldn't wait to get back to the hotel to try this, so I found a nearby bench and dug in. 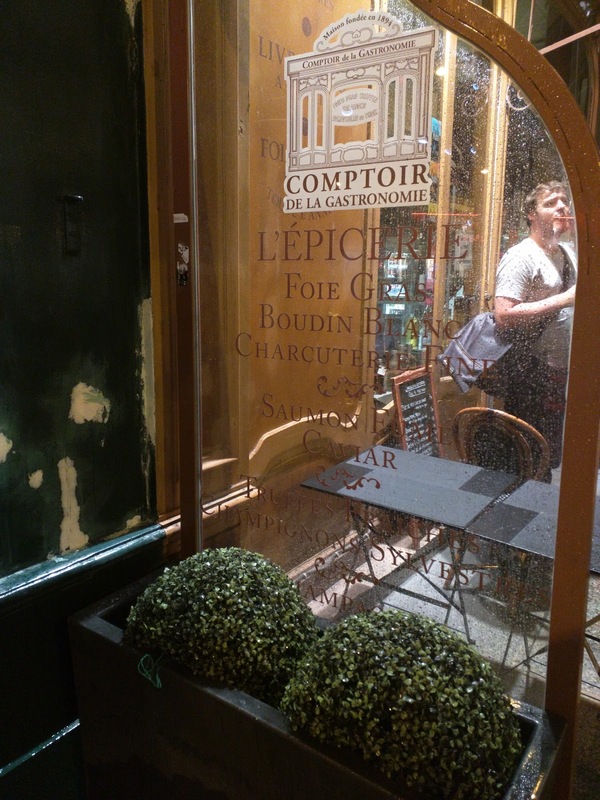 It was with my Praluline, sitting on a bench on a tiny side street, that I finally met my first friendly Parisians. Nearly every person who walked by ... smiled at me. A few offered a cheery "Bonsoir!" I think they could see the glee and excitement on my face. One even wished me "Bon Appétit!" Well huh, this was different treatment! Perhaps from the photo of the packaging you can see how, uh, massive the thing was. People said they were big, but I had no concept of how big they truly were until I arrived at the shop. It was as big as my head, honestly. I include this photo, just to give you context, with my hand stretched out as big as I could make it, it still wasn't even close to the size of the Praluline. Which gets me to part of the story. Pralulines are the only pastry they sell at the shop. Everything else, as I said, is chocolates. Praulines come in two sizes: "individual" or "large". I saw only one size, in both the window and behind the counter, even though a sign listed both sizes. And, they were huge. It was 7pm when I arrived, and they close at 7:30pm, so I assumed that the issue is that they were out of the small ones. So I attempted to ask, just to double check. I didn't actually want something that massive. I thought I was going to get, well, an individual treat. I was assured that no, THIS was the petite size. ZOMG. I had no choice but to get the massive thing, and suddenly, the 6.50€ price tag made more sense. Oh, did I mention, it weights 600g? Uh, yes. Also, I did slightly lie. 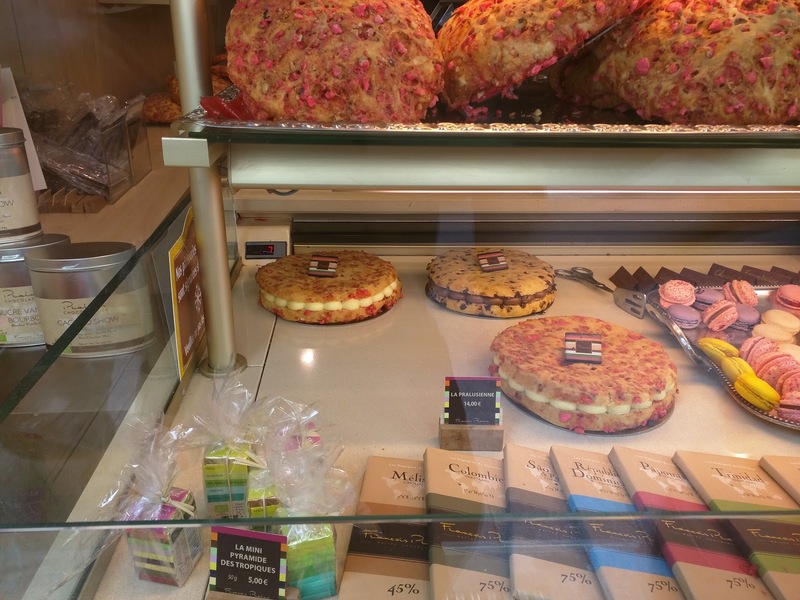 The Praluline isn't the only pastry they sell; they also sell a chocolate version, with chocolate chips in it instead of pralines. They didn't have any on my first visit, and I can't imagine they are nearly as special. I'm sure they are great warm though, and clearly, they must use awesome quality chocolate. Ok, I lied even more. Besides just Praulines, they also sell Pralusiennes. 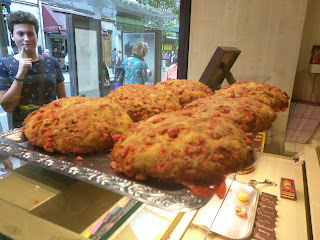 These are tropéziennes, Pralus-ified, aka, giant stuffed Praluline (or chocolate one), filled with vanilla crème mousseline. I can't even imagine the insanity that thing is. Luckily for me, they were out of when I visited the first time, and I knew better the second time. I think the Pralusienne would do some SERIOUS damage! My first visit was on my first trip to Paris, in the evening. 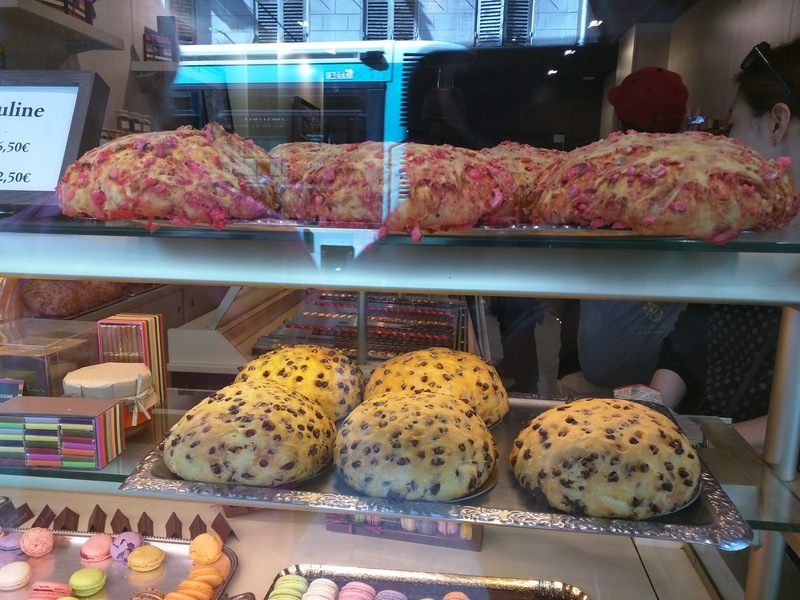 "A rich brioche flavored with pieces of pralines made in-house: Valencia almonds and Piedmont hazelnuts coated in rose sugar and then cracked. " Ok, so getting to the real review. Yes, a Praluline is just a (very large) round broiche loaded with bits of praline. 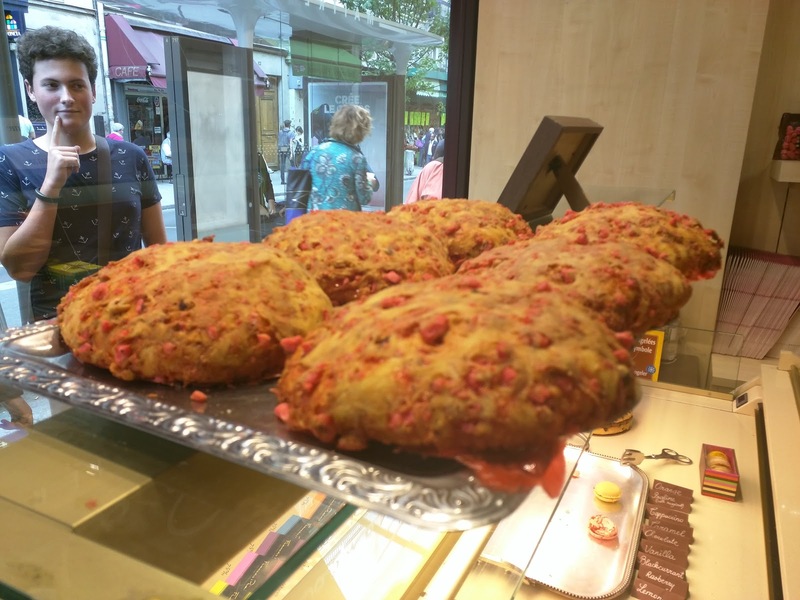 They make the pralines in-house, from both almonds and hazelnuts, coated in rose sugar. The pralines are then cracked and baked into the dough. Sounds simple enough right? First, the pralines are pretty amazing, just on their own. Very generously coated in the rose sugar, they are basically candy, but with a bit of bitterness from the nuts. Crunchy, sweet, addicting. You can buy containers of just the pralines, which, I did on my second visit. But add these things to brioche, and, well, the result is astounding. You see, the candied pralines turn into magic when they bake. Some of the sugar comes off and forms gooey little pockets of rose flavored sweetness throughout the bread. Exterior bits turn more into hard candy. The result is a sweetness that just welcomes you in so many ways, from the rose sugar in its several forms, to the sweetness from the brioche base. The brioche is good too, rich, slightly sweet, fluffy, perfectly cooked. It isn't dry, it isn't crusty, it isn't too dense. The end result is complete addiction, as you keep wanting to have just one more bite of the crispy candy edge, just one more sweet gooey pocket, just one crunchy nut. I was a bit unsure of what to do with my Praluline though. I wasn't actually expecting something quite so sweet. I immediately lamented that it was 7pm, and this didn't seem like the appropriate time to eat such a thing. I think it would be AMAZING with a cup of black coffee for breakfast. Yes, it was loaded with sugar, so not the breakfast of SOME champions, but I assure you, this would make for an amazing breakfast. I vowed to only eat 1/4 of it that night, which seemed entirely reasonable, still the size of a very large individual roll. I knew I should give Ojan a chunk, and assumed I'd have about half left after that, enough for breakfast the next two mornings. People say these keep fine for a few days (and freeze wonderfully), so this seemed like a great idea. I took a few more bites, blown away by sweetness and honestly, confusion, and decided to go get some savory food. I still just wasn't sure what to make of the thing. And then a few hours passed, and I was sitting back in my hotel room, glass of red wine in hand. It dawned on me that the Praluline would ALSO go great with a glass of red wine. I pulled it out. And devoured it. All of it. I couldn't stop. Once you get going on one of these, I think it is actually impossible to stop. I no longer questioned that this was considered the Petite, or Individual, size. The folks behind me in line were a group of 4, one of whom had been there before. The others saw the size, and said they should split one. The returnee assured them that they all needed their own. They all acted like she was crazy. She wouldn't listen, and refused to split with anyone. Again, I see why. No matter how big it is, there is no way you'll want to give one up either. It was fantastic just as it was, ripping off little, or not so little, chunks as I went, but I also wonder how it would be if you warmed it up, and put butter on it. If I somehow ever wound up with a piece that was slightly older, I'd certainly consider doing that to revive it a bit. It certainly didn't need it when fresh though. Update ... the next day. I went back. I had to. I went at 11:30am, right after they opened. I got a Praluline. It was hot and fresh. It was a thing of beauty. So fresh, it was moister, fluffier, gooier. I might have slightly preferred the cold version with the hardened, candied edges, but it really is a toss up. 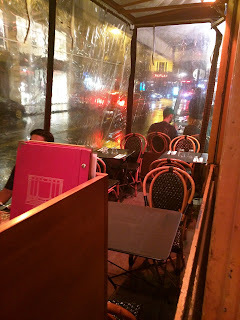 A year later, I found myself in Paris again, for a *very* short work trip. 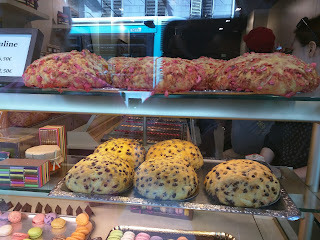 I didn't make it to any other patisseries during my time, which, quite frankly, is a bit absurd. 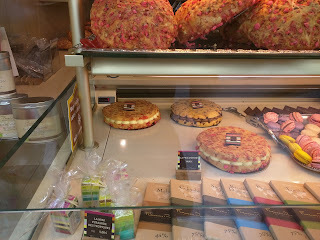 I was in Paris for 3 days and went to no bakeries???!!! What? Yeah. Partially I was just really busy with work and didn't have the time. I did have some good eats and enjoyed an excellent Michelin starred meal at Fables, had a team dinner at the highly mediocre Le Souffle, and had some excellent soft serve ice cream from Jeff Brudges, but, alas, no pastries. 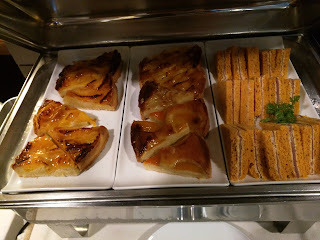 I also had an incredible breakfast buffet at the Westin which included amazing warm brioche bread pudding, cheesecake, mini frosted donuts, and crispy puff pastry brioche every morning, and was working from an office with fantastic desserts, so, it isn't like I was *hurting* for pastries. Anyway, on my last day, after feasting at breakfast again, I got a message that the other people I was meeting with were running late. I had 30 minutes. 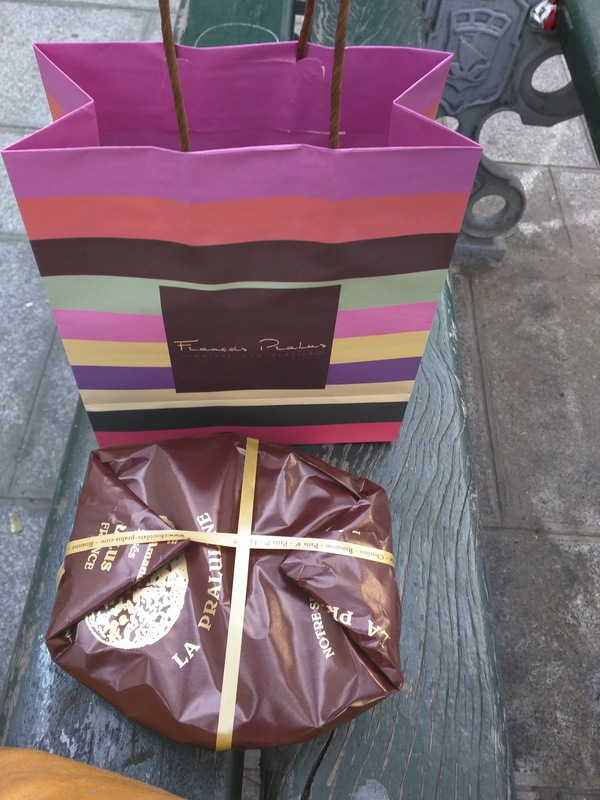 I was a 30 minute walk away from Pâtisserie Chocolaterie Pralus. So, I decided to jog there, making it in just under 15 minutes. I quickly ordered a praluline from a remarkably friendly, English speaking woman, stashed it in my bag, and jogged back to the office. I was only 2 minutes late. It was a ridiculous move, but, well, necessary. How could I visit Paris and NOT get another of these? I snuck a bite the moment I had any room in my stomach. 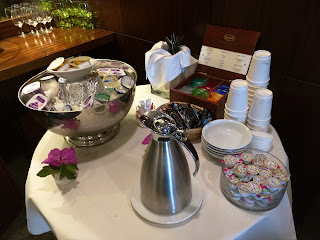 As much as I loved my breakfast feast of bread pudding, cheesecake, a mini donut, and sugar brioche, I regretted filling my stomach with sweets that, while good, weren't the best things ever. Because the praluline? It is. I had high expectations going into this, but, the praluline lived up. Such soft, fluffy, sweet bread. Deliciously sweet and crunchy pralines. Pockets of gooey sweet bits. The top had a crusted layer of praline sweetness. I adored it. I wanted to devour the entire thing on the spot. I don't understand how it can be that good. But it is. 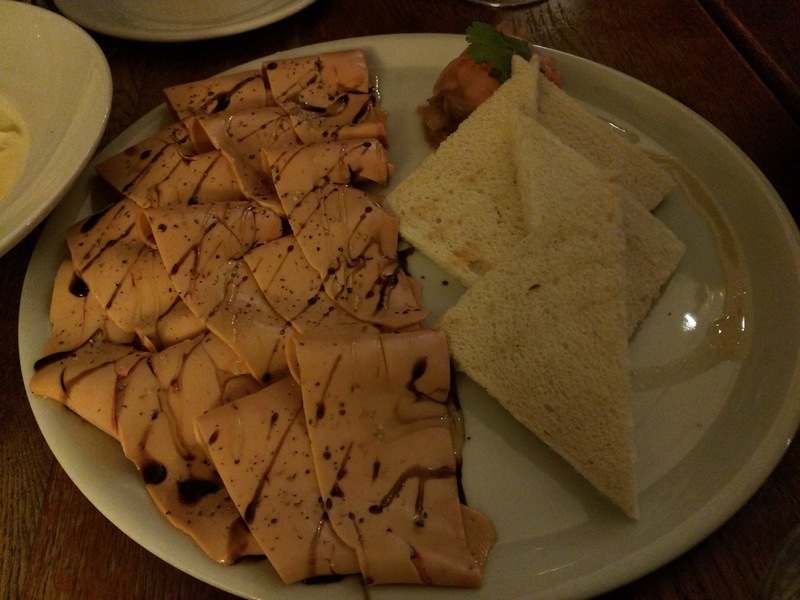 I was in Paris for a full week before I finally had foie gras. Yes, sad but true. Clearly, my complete and utter obsession with foie gras from the days when it was banned in California is over. 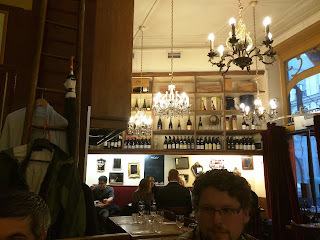 Amusingly, Ojan, who never wanted to partake in my foie gras adventures back in the day, had foie gras two times before me (he was going to different business dinners than I, and his went places with foie). Anyway, when planning my Paris adventures, one place I had high on my list was the restaurant at Le Comptoir de la Gastronomie, known for ... the foie gras. It will come as no surprise to you that it was recommended to me by Emil, although, it isn't a 3 Michelin star, or a 2, or even a single star. Yes, he recommended somewhere not Michelin rated! (Of course he also told me to go to all the crazy expensive 3 stars too ...) But he wasn't actually the first to mention it; two of my other friends, who dined with me in Mallorca, said it was their favorite place of all their time in Paris. So I quickly made a booking for 4 people one night early in my trip, knowing that I'd be able to fill the seats. And then ... Ojan, and the other two folks who wanted to come, got pulled away into a business dinner, and couldn't come. They begged me to re-schedule, and two more people wanted to join, so, I rescheduled for later in the week, for a party of 6. We set out to (finally) get foie gras. Sadly, I didn't love the meal. The food was all fine, but not memorable in any way, and flavors were very bland. Prices were reasonable. I guess that sums it up, everything was just lacking any real flavor. Of the 9 different dishes we ordered, only one (the seared foie), would I even get again. Maybe it was an off night? I really trust the folks who recommended the place to me, and Yelpers and TripAdvisor folks also love it ... The ambiance and experience were nice though, and it suited our group well. As we approached, it was easy to know where we were going ... they had a big duck sign out front! 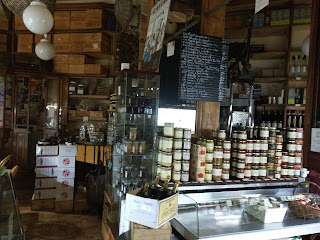 The restaurant is actually attached to a gourmet food store, selling all sorts of products, specializing in foie gras. It was open when we first arrived, but closed up while we were there so I didn't get a chance to browse around. Next time, I'd be sure to do some shopping BEFORE my meal, or perhaps visit the restaurant at lunch time. We entered through the small outside seating area, with only 4 or so tables. 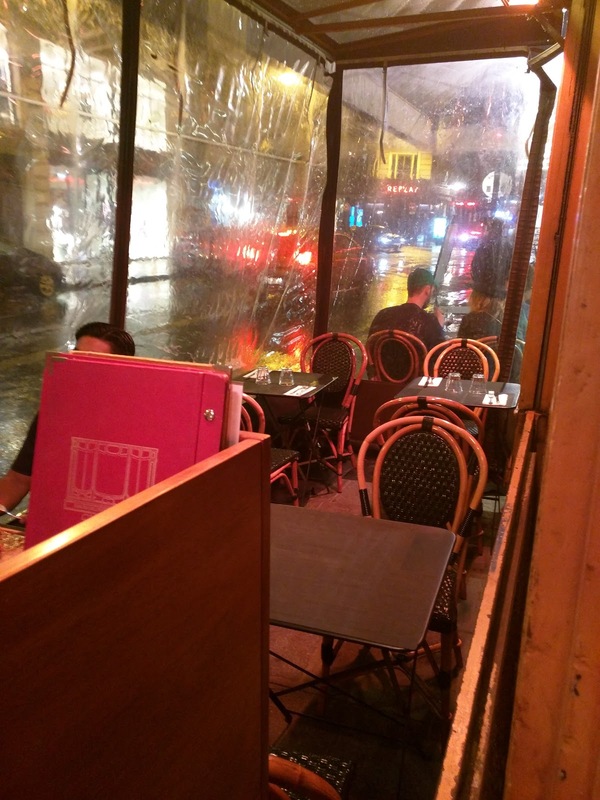 Since it was pouring rain and quite cold, the outside area was enclosed in a plastic awning, and heat lamps were on, so it was quite cozy out there. But, we were seated indoors. Inside, the restaurant was quite small. The decor was really hard to describe. The tables and chairs were wooden and kinda battered, with red velvet seats. The lighting was ... chandeliers. 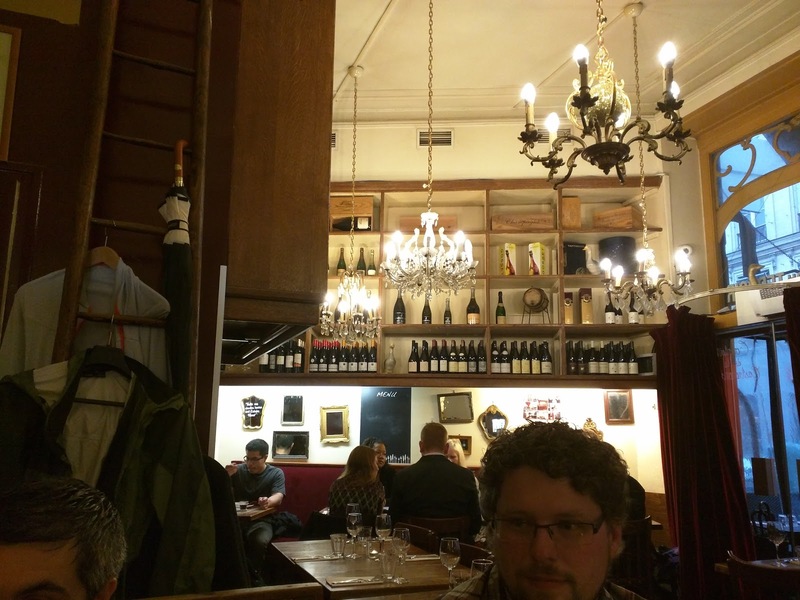 The back wall housed a open wine rack, and ... mirrors. There was a random ladder for folks to hang jackets on. Charming, in its own special way. Staff were dressed casually, in T-shirts bearing the restaurant name and logo. Service was ... ok. They were friendly, and spoke English with us, but were a bit lacking in attention. It took a long time to order, and absolutely forever to have someone even glance our way so we could aggressively flag them down to get the bill at the end. We asked for share plates for our party of 6, and received only 2. 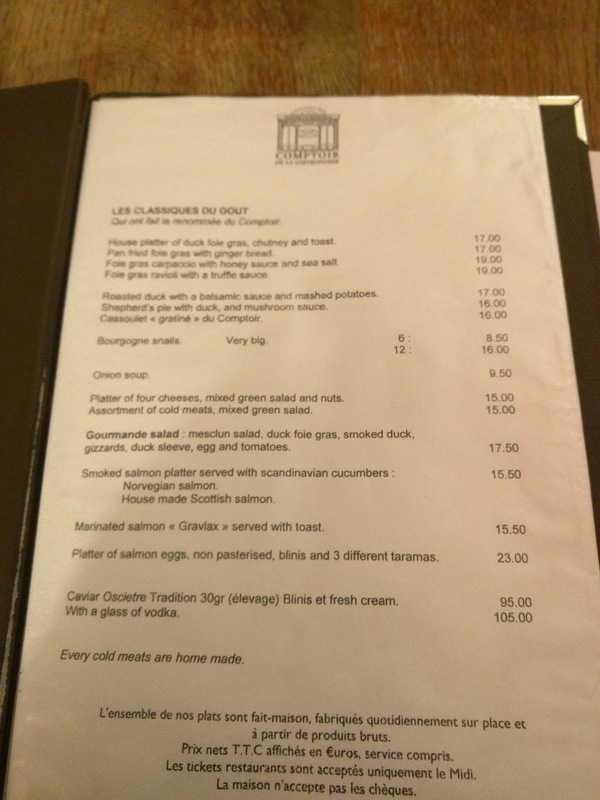 We asked to have things coursed in a particular way (soups and salad to start, foie courses next, then mains), and we got the soup and salad course and then ... everything else. They weren't rude though, and did change out our silverware between courses, so, that worked. 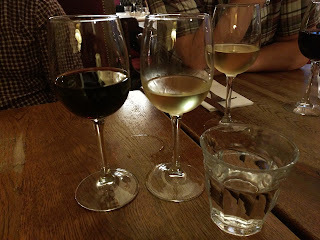 Since we were ordering red meat as our mains, and plenty of foie gras, we needed two wines. I suggested a Sauternes to go with the foie, and our group was easily able to split a half bottle. Amusingly, when the server came around to pour it, she really mis-portioned it. She knew she was pouring for 5 people, and started with me. I got a huge pour. As did the next two people. The fourth got a reasonable pour, and the last? Uh, a dribble. She realized what she'd done, and asked if we wanted to get another bottle. I love Sauternes, but, no, one can only drink so much of that sweetness. I volunteered to give some of mine away, as it was a really insanely large pour of such a sweet wine. The Sauternes was fine, nothing remarkable, sweet and syrupy, as you'd expect. It was the first time several in our group had Sauternes. For a red, someone else in the group picked it, so I don't even know what it was. I was busy ordering food for the entire table. Both wines were served in the same generic glasses. 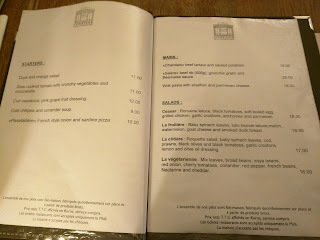 The menu (given to us in English), confused everyone, except me, since I knew what to expect. The first page contained the Classics, dishes they are known for, and are always available. This section had all the foie gras (4 different preps! ), plus their heavy hitting main dishes of roast duck, duck shepherd's pie, and cassoulet. It also had french onion soup, cheese and charcuterie plates, assorted smoked salmon preps, and caviar. The dishes weren't really listed in an order that made any sense, which lead to everyone's confusion. I knew the roast duck was a main, but why did it come before the french onion soup on the menu? Before the caviar? The next two pages were the seasonal menu, and were broken down into starters, mains, and salads, in a more reasonable way. I proposed that I just order for the table, sought out specific requests, and took care of ordering. 3 of the 4 foie dishes, plus a few things they all wanted, and it was time to get going. As I mentioned, we asked to have the meal coursed out, because the server asked us if we wanted it all at once when we ordered. We assured here that no, we didn't. I suggested the soups and salads to start, followed by the foie dishes, followed by the mains. We did get the intended starters first, although it took quite a while, and no share plates were provided, even though we made it clear that we were sharing. The starters were fine, but not memorable. La tomate confite farcie aux legumes croquants et mozzarella. 11€. "Slow cooked tomato with crunchy vegetables and mozzarella." We felt a bit guilty that our meal was all highly decadent and heavy, so we opted for some vegetables to get started (you know, vegetables with cheese). None of the salads jumped out, so someone suggested the tomato and mozzarella from the seasonal menu. It was not a standard tomato and mozzarella, which we somewhat expected given the description, but I still didn't expect this. I was really surprised when it arrived, as I knew this was a very rustic restaurant, and wasn't anticipating the plating. The mozzarella was standard mozzarella, not much to say there. The tomatoes were downright adorable, cut open, stuffed, and then their tiny little lids put back on. The tomatoes were cooked, and fine, but not particularly flavorful, they didn't scream "fresh seasonal tomatoes" to me. Inside was chopped up vegetables, including zucchini, but I'm not sure what else. These veggies were either raw or lightly cooked, still quite crunchy. I really have no idea what the sauce was on the side, it had no distinct flavor, wasn't mentioned to us, nor listed on the menu. This was all fine, but not particularly interesting, flavorful, nor memorable. 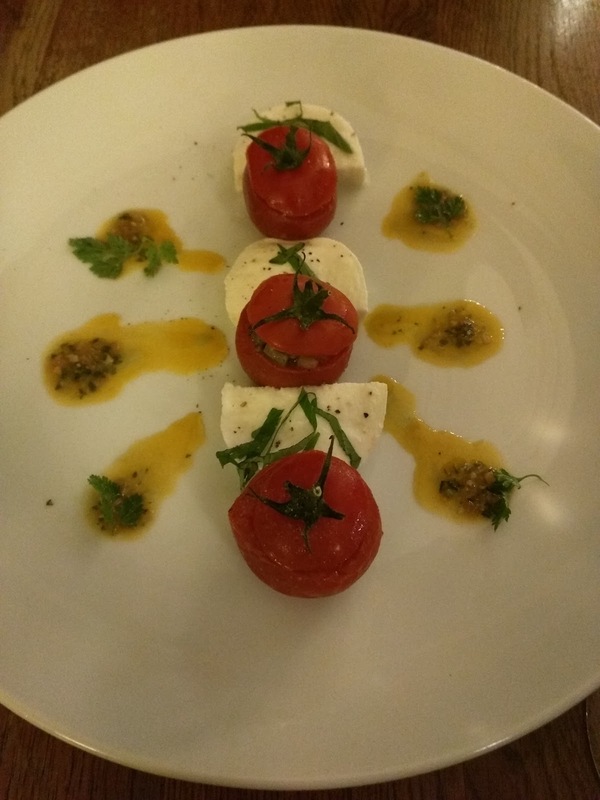 Cute plating, nice to see tomato and mozzarella offered in a different way, and ordered just to get some veggies. Wouldn't get again. 11€ price was fine. Probably my second to least favorite of the night? Hard to say, when there are so many I wouldn't get again. Soupe à l'oignon gratinée. 8.50€. 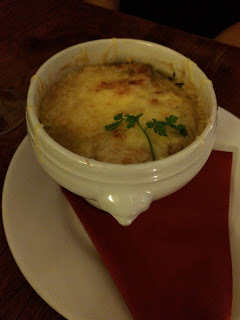 When I read reviews of the restaurant, there were many, many mentions of the french onion soup. Not something I really care about, but others really wanted it, so I got a couple for the table. One person, who really wanted the soup, took his first few bites, and declared, "I'm going to punch someone in the face over this soup." Apparently, that means he really liked it (incidentally, he was also with me in Mallorca). The soup was topped with copious amounts of melty cheese and bread, and loaded with soft cooked onions. It was fine, but honestly just like any french onion soup to me, and I actually had better french onion soup the day before in my office cafe. The others all loved it though. Probably my third to least favorite of the night. Next, we were expecting our course of foie dishes. I opted to get 3 of the 4 preps: seared, carpaccio, and stuffed in pasta, so we could really experience the range. They got delivered with the mains, in a pile of chaos. There was absolutely no way to fit it all on the table at once, so we had to get creative. Anyway, I'll still review them first. These all came from the classics section of the menu, and, frankly, were the reason we were there. The foie preps were the highlight of the meal for me, but, none were better than what I've had many other places. Carpaccio de foie gras de canard cru au miel et caramel balsamique, sel de Guerande. 19€. "Foie gras carpaccio with honey sauce and sea salt"
I laughed a bit at the translation. 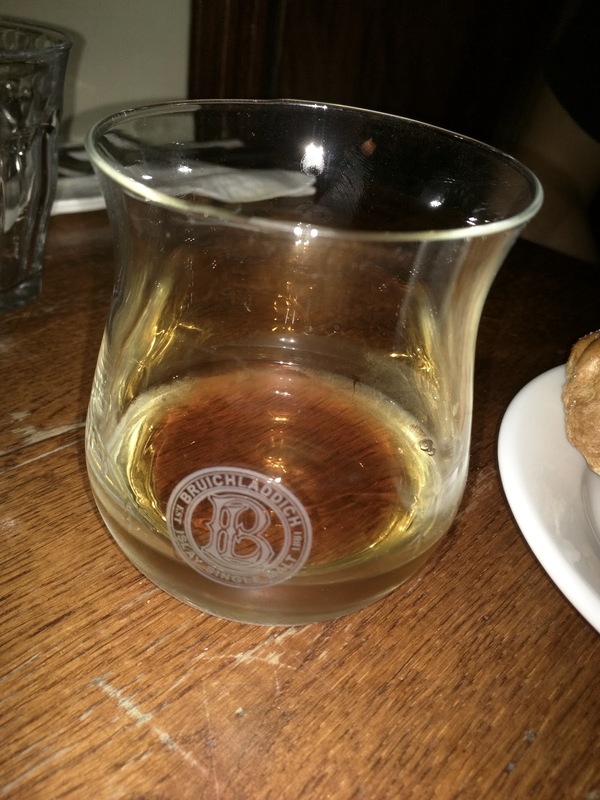 Our menus said "honey sauce", the french menus said "au miel et caramel balsamique", aka, honey balsamic caramel. Of course, I didn't have the french menu when I was there, I looked it up afterwards, so only then did I realize why my "honey sauce" was dark brown. The platter of foie carpaccio we ended up saving for last, since it was a cold dish, and everything else was hot. Not as intended, but we had no other way to tackle the massive amount of food before us. I still wish they had coursed this properly, or that I had opted to have this with the soup and salads, as that could have made more sense. Anyway, the carpaccio was super thinly sliced, laid out in sheets. The flavor was very mild. Drizzled on top was the sauce, sweet and a bit sticky, and a good compliment to the foie. I didn't find the salt anywhere on the plate, which is sad, as it is needed with foie. I didn't try the bread, but it was just toasted white bread. The others were grumpy with the bread, originally concerned that there was no good way to share it, and then not even touching the final slice. They really wanted something more interesting, like a rye. Overall, this was fairly lackluster. Bad pairing of the pickled stuff, boring white bread, mediocre foie gras, and no salt. The 19€ price I guess was fine for a large serve of foie, although it was so thin that there wasn't tons of substance. My third pick of the night, but I wouldn't get it again. Escalope de foie gras de canard poelee sur son pain d'espices et mesclun. 17€. "Pan fried foie gras with ginger bread." I again laughed at the translation. What happened to mentioning the mesclun? Next up was the dish that should always be the star of the show. Seared foie gras. I got the carpaccio just to try an assortment of foie preps, but this is the one I was eagerly awaiting. 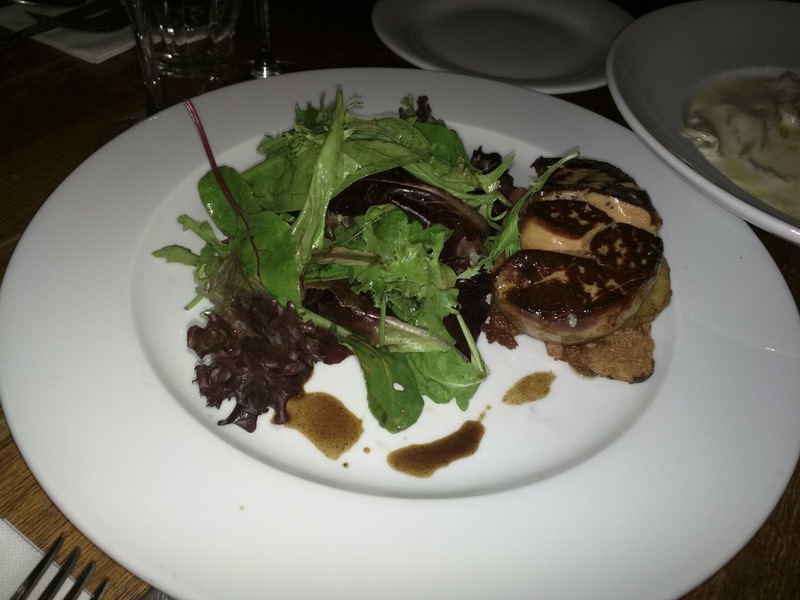 The serving was large, a huge lobe of foie. It had a nice sear on it, was decently creamy, but it too was pretty mild flavorwise. It hade some stringiness to it as I cut it into 6 pieces. The pairings here, unlike the carpaccio, were actually quite good. Served on top of a slice of cooked pineapple and a thin slice of gingerbread. The sweet pineapple and the sweet and spicy nature of the gingerbread really did make for a perfect bite. Seared foie, sweet elements, and a bit of crunch from the bread? Delicious. Of course, the menu didn't mention the pineapple, so it is a good thing Emil wasn't with us, as he hates pineapple, and this would have ruined the dish for him. We didn't really touch the mesclun, it didn't seem dressed in any way. Overall, a good dish, nicely composed, all aspects of it worked well together. Generous portion for 17€. My favorite dish of the night, and the only one I'd get again. Ravioles de foie gras de canard a la crème de truffe. 19€. "Foie gras ravioli with a truffle sauce." And again, dropping things from the translation. Truffle sauce ... hello, this was truffle CREAM sauce. But I knew this would have a cream sauce. This dish, hands down, is the most reviewed. Everyone goes nuts for it. So we ordered two. I expected it to be amazing, given the rave reviews, and, well, the fact that it had foie gras and truffle cream sauce. 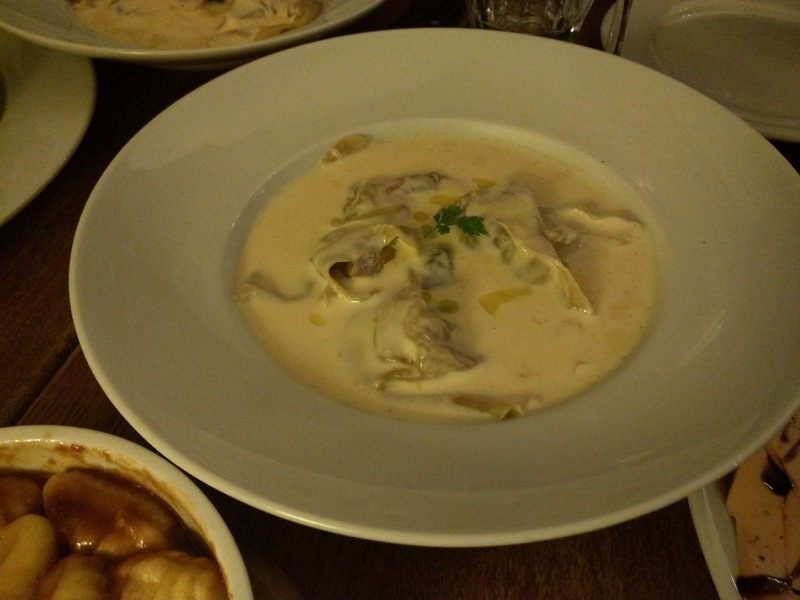 Each dish had 6 large, free-form pasta pockets, not traditional ravioli shapes, with a chunk of foie inside. The foie flavor was basically non-existent. It was mild in the previous two dishes, but absent here. While I was excited for the foie pasta, I really was excited for the truffle cream sauce. I'm such a sauce girl, particularly creamy sauces! It was ... completely boring. No real flavor. Including, no truffle flavor. Ojan, who is insanely truffle-adverse, couldn't taste any, and he can detect truffle in just about anything, even when it is subtle, subtle, subtle. I was pretty disappointed. The pasta was cooked fine, but it was really, really boring. This should not be a boring dish. I expected we'd want to keep that sauce around to lap up with our bread and sock up all the deliciousness, but no one did. I tried a few times, trying so hard to like it, but alas, it never happened. Still, it was my fourth pick of the night, only because I honestly didn't like anything else. The main dishes we picked were all from the seasonal menu. The three from the classic menu were roasted duck (which no one seemed excited by), cassolet (which I read negative reviews of), and duck shepard's pie (which we would have ordered if we needed one more dish), but everyone wanted the beef specials instead, so, beef it was. Bread seems to always be served with the main dishes, in a basket. The bread was not typical french baguette. It was soft and not crusty. It was replenished for us several times. It was fine, fresh bread, but not remarkable. 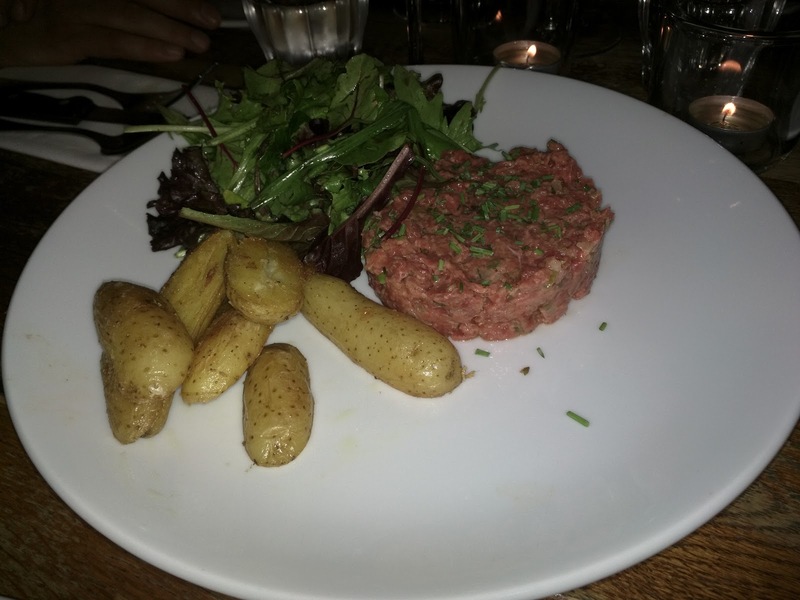 Tartare de bœuf charolais préparé, pommes rattes sautées. 18€. "Charolais beef tartare and sautéed potatoes"
The person who really wanted the onion soup, also really wanted the beef tartare, not something I ever order, because I just don't care for the texture of raw beef, nor the raw egg. I wasn't even planning to try the tartare, since I don't like tartare (and nothing else in the meal was great so why would this tartare be any good? ), but everyone encouraged me to, saying it was great. And I'll be honest, for tartare, this really was good. The beef was nicely chopped, there was no egg (unless it had been mixed in for us, but it wasn't the traditional style where it is sitting in the middle), and it was actually nicely seasoned. The entire rest of the meal was flavorless and poorly seasoned, but this was actually flavorful. I didn't try the simple sautéed potatoes, but even our potato eating Australian didn't care to finish them. The greens on the side also went unfinished, as again, totally undressed. Who wants just plain greens? At least put some oil, salt, and pepper on? Somehow, my second favorite dish of the night, because it had flavor, but I still wouldn't get it again, because I still don't actually want tartare. Côté de bœuf de Salers (500g) à la poêle, gratin de gnocchis au jus, véritable Béarnaise. 29€. 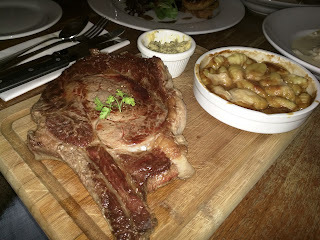 "Salers beef rib (500g), gnocchis gratin and Béarnaise sauce." Again, with the leaving details out of the translation! 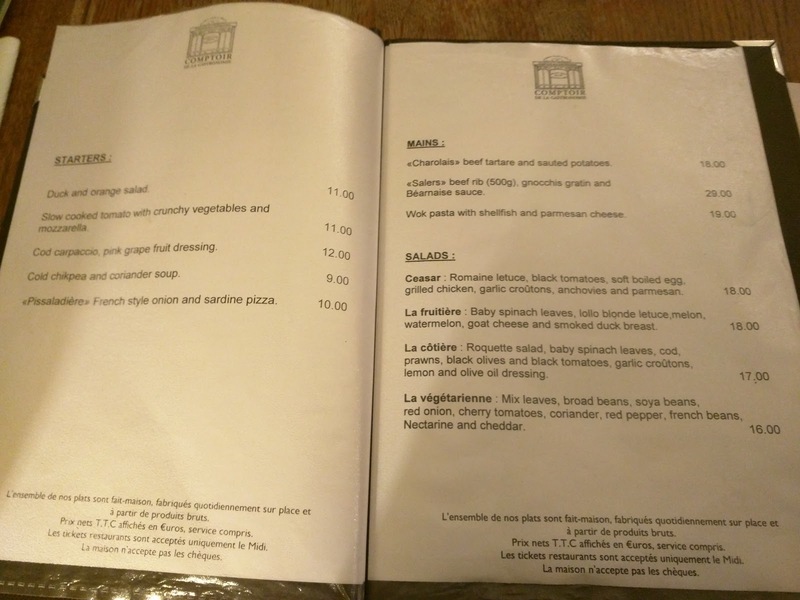 Given the English description, I was expecting a "gnocchis gratin and Béarnaise sauce" ... thinking perhaps the gnocchi would be in a Béarnaise, but even if not, that they'd be ... gratin? Doesn't gratin imply that they should be baked, with a crispy top of cheese or breadcrumbs? The steak was impressive in its size, which we expected, since the menu did warn us it was 500g. We were told that the chef recommended medium, but we could cook it more if we wanted. More? We were going to order medium-rare, but opted for medium, since she told us this. The steak was ... chewy. I'm not a huge steak lover, but Ojan does like steak, and said this wasn't very good. Anyway, the gnocchi was not great. Not a gratin, or at least not what I think of as a gratin. Just potato dumplings, in jus. No one wants gnocchi like this, do they? Ours went unfinished, even though the portion was small, and there were 6 of us. The Béarnaise sauce stumped me. It was served in a ramekin on the side, and was ... solid. It was more herbs than sauce. It didn't pour, it didn't spread. Is this what Béarnaise sauce is in France? It also just wasn't very good. Honestly, it seemed like just cold herbed butter. So strange. Overall, nothing very good here, my least favorite dish of the meal. Desserts all came from the seasonal section, and were another part of the reason we were there. Yes, I love desserts in general, but there were some stars on the menu. The dessert menu had 5 options, plus sorbet and ice cream. One was a lemon/lime based, so we ruled it out immediately, since neither Ojan nor I like these flavors in desserts. Another was just a poached peach with chantilly cream. The warm chocolate pudding cake with vanilla ice cream got a vote or two from the group, but it takes a while to prepare, and neither Ojan nor I would be indulging in that due to the caffeine, so we skipped that one two. The final two options though were winners: crème brûlée and a giant eclair. Ojan loves eclairs, and these eclairs are known for being special. 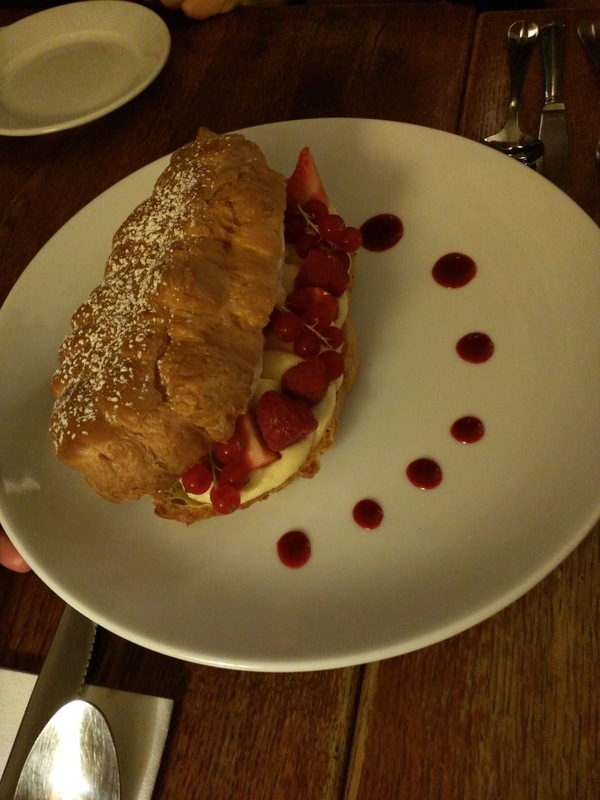 Our group opted to get a crème brûlée, too, just to try something different (and perhaps to please me since I love crème brûlée), but really, we had all eyes for the crazy eclair. We also ordered a few drinks to go alongside our desserts. I opted for my classic dessert pairing, a decaf coffee. 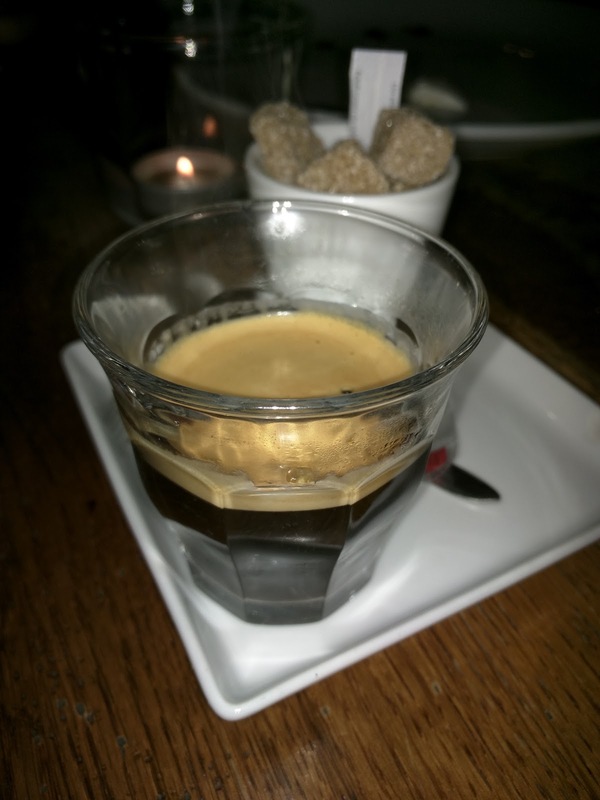 I forgot to say I wanted an Americano though, so was a bit surprised when a decaf shot of espresso showed up. Oops, my bad. It was fine, but nothing remarkable. Served with brown sugar cubes, a stick of regular white sugar, and a speculoos cookie. Everyone else went for port. They had a red and a white on the menu, with no other information. What winemaker? What year? What grape? Who knows. I had never had white port before, so I tried a few sips. Very similar to a red port, except a bit more ... maple-y? Interesting for sure, and the price of 5.50€ was fine for the pour. So to start, the crème brûlée, one of my favorite desserts. 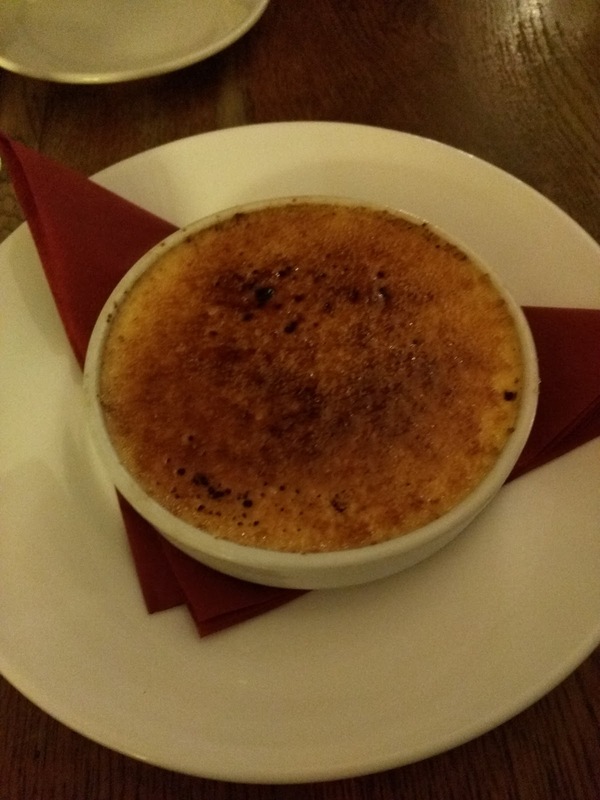 I love puddings, and I love crème brûlée, so I looked forward to this, even though it was cardamom flavored, which is not a flavor I gravitate towards. 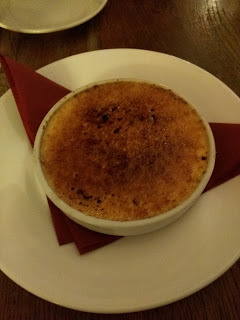 The crème brûlée clearly was not made to order. It was cold. -1 point, I like the contrast of the hot top and cold pudding. The top was fairly thin, a decent caramelization, but not as prominent as I'd prefer. Not bad though. But the pudding was ... just pudding. The texture was nothing remarkable. And yes, it did taste like cardamom, so I didn't really like it. Not my thing, and even though we only had one, no one else took more than a second bite. The 8.50€ price was fine for the size. Vanilla and Red Berries Eclair. 11€. And now for the eclair. I knew what to expect here. These were HUGE! And of course we ordered multiple. I was shocked by how light this dish actually felt. 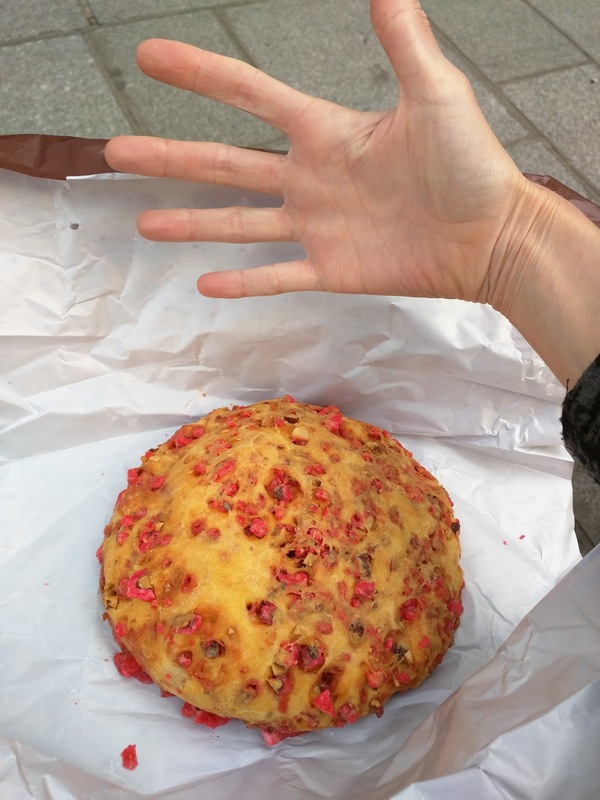 Yes, it was huge, it was pastry, and it was cream, but it felt light somehow. The choux pastry in particular was very light and airy. It wasn't too eggy, which is always the main reason I don't like eclairs or cream puffs. Inside were actually two different layers of filling, in addition to the berries. One was a thick vanilla custard, a basic pastry cream filling. The texture was a bit thicker than I expected inside here, and there was more of this than anything else inside, so it did somewhat overwhelm the rest of the flavors. Slightly less would improve the overall eating experience. The other filling was basic sweet fluffy whipped cream. I think this helped contribute to the lightness. Yes, it was just whipped cream, but it combined nicely with the other filling and the pastry. It was also fun to have two different fillings inside. Berries were not as dominate of a component as I expected. They were displayed on the open portion of the eclair as you can see here, but didn't fill the other side. There were a few raspberries and chunks of strawberry, but mostly red currants. The fruit wasn't particularly interesting, and I don't really like currants, so these didn't add anything to the dish. 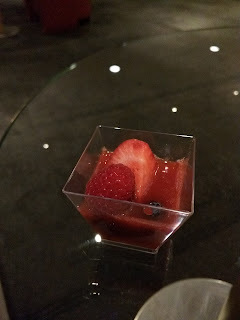 But on the plate was a few dots of berry puree, that no one else touched. And since they all devoured their portions rapidly, rather than taking their time, decomposing it, and taking notes like me, it was all left behind. None of them thought to use it! I however ate my chunks of eclair with my fingers, dragged them through the sauce, and really enjoyed the sweet sauce with the custards. And I got all the sauce, not just the one from the plate I took eclair from. Yes! Overall, this was good enough, and I enjoyed my chunk of eclair, particularly when I scooped out a little custard, removed the currants, and added the berry sauce, but I wouldn't go back for it. 11€ is pricey for a dessert at a casual place like this, but, it was enormous. 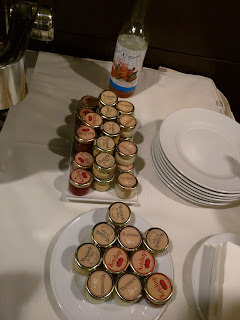 During one of my visits to Paris this past year, we decided to stay two nights at the Sheraton Paris Airport hotel, since we had an early morning flight, and wanted to avoid the transit time from the city that morning, and had planned a day trip out of the city the other day, from a station located at the airport. The hotel is, literally, inside the airport. If you ever have an early morning flight to take out of Paris, it works well. Being a Sheraton, they have an executive lounge serving breakfast and evening canapes, but, unfortunately it was closed for renovations during our visit. Instead, they set up a temporary lounge of the side of the public bar area. We visited for evening canapes both nights. It was ... lackluster. I have no idea what it is like when they have a real lounge, presumably closer to cooking facilities, but this was basically an abandoned corded off area, with no one attending the space, no way to keep hot foods hot, cold foods cold, and no signs labelling anything. Instant coffee and tea. Yogurts and butter. For hot drinks, there was a box of tea bags, and packets of instant coffee. I hope that the real lounge actually has a coffee maker? In a bowl next to the hot drink station was a couple yogurts, and three types of butter, just set out on ice to keep cool. Yogurt as part of the evening canapes seemed odd to me. 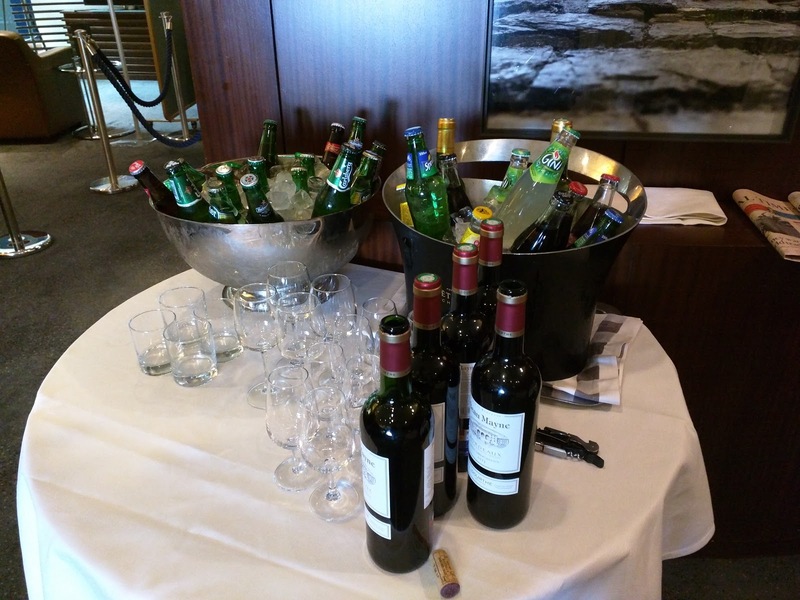 For cold drinks, there were a few soft drinks, a few juices, and a few beers. One choice of white and one choice of red wine. No hard alcohol. No bubbly. Very weak offering. 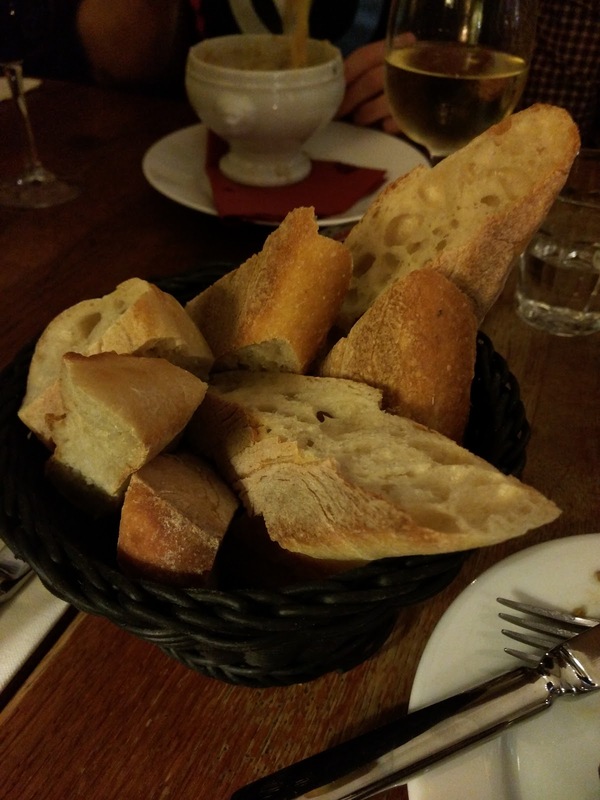 We were in France, so there should be good bread options, right? Nope! A basket of rolls, with no tongs to serve them. There were perhaps three different types, but all were rock solid. 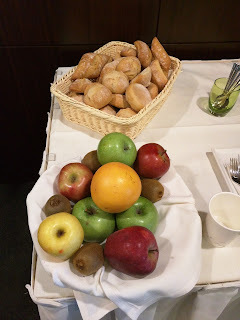 The fruit selection was whole fruit: apples, oranges, kiwi. 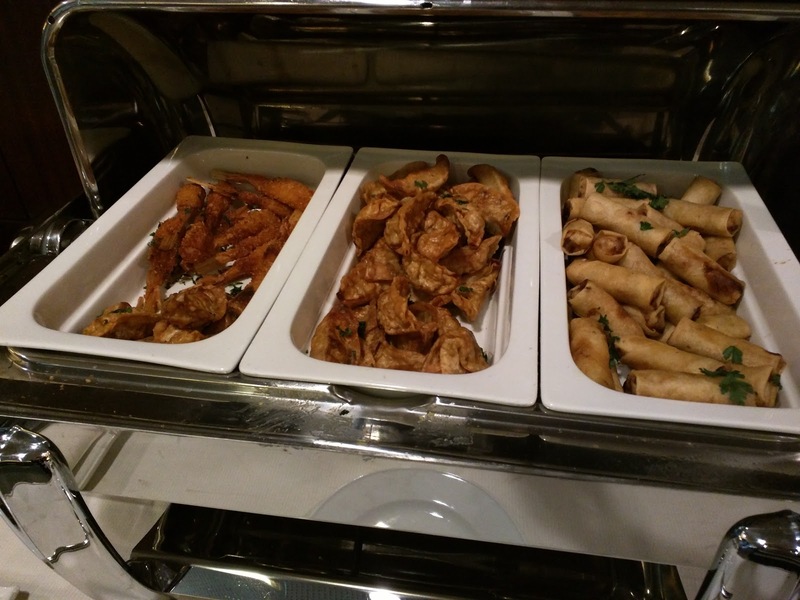 Hot Foods: coconut shrimp skewers, potstickers, spring rolls. The lounge had 3 quasi-hot offerings. The first time I visited, there were coconut shrimp skewers, potstickers, and spring rolls. The coconut covered shrimp were inconsistent. One had a bunch of shell(! ), and was rubbery, truly awful. Another was ok. The potstickers seemed to be pork? The filling was mushy and not very good, but the shell was kinda crispy and good enough. The spring rolls seemed to be chicken, with a bit of mushy vegetables inside too. The spring roll wrappers themselves were super mushy and not good. The biggest issue is that all of these items were lukewarm at best. They had no heat source available, so the canapes were in metal pans with lids, but I'm pretty sure the had been sitting there for quite a while, losing heat. 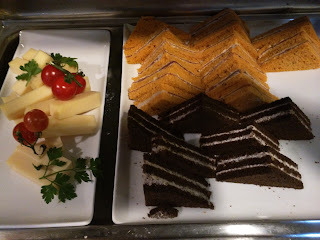 I hope that when they serve in the real lounge it is better than this. Later on that night, they swapped in tandoori chicken skewers. The tandoori chicken was decently spiced and had a bit of a grilled flavor. It wasn't awful, but, it was chicken, which I don't care for in general. The next night, the options were spring rolls, coconut shrimp, and ... the most interesting curry I've ever countered. The curry was a chicken curry. With dried apricots. And prunes. And crunchy pistachios. And crunchy cashews. The flavors were decent, there were tons of textures. It was interesting at least. The condiment line up was ketchup, mustard, and mayo pots. I'm not sure which of the items those were supposed to go with. There was also a bottle of sweet chili sauce, that would have been nice with the spring rolls and coconut shrimp, except, it was empty. I looked around for someone to refill, but, there was never a staff member in sight. The next night, they had sriracha instead of sweet chili sauce. Sriracha with spring rolls and coconut shrimp? Interesting choice. Night #1: Cheese, Sandwiches, Pasta Salad. 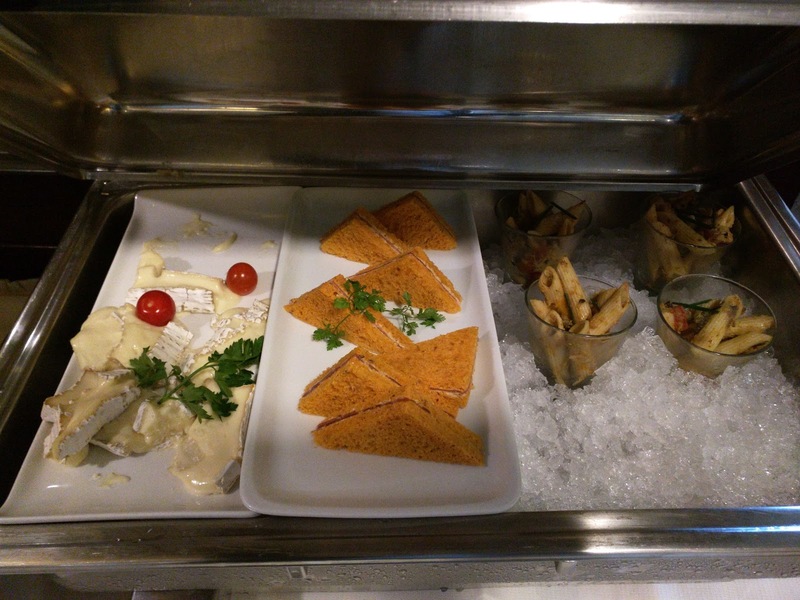 Another metal tray had chilled savory dishes, on some melted ice. The pasta salad had a few assorted mushy cooked vegetables (tomatoes, zucchini, and perhaps something else). The veggies had a bit of flavor but were oily, and the pasta was entirely boring. The sandwich I tried, yes I know, shocking, because I don't like sandwiches. Why would I try it? Mostly because I was just sad by the offerings. It turned out to be the best thing. Sundried tomato bread, some kind of cheese spread, and some kind of meat. The bread was pretty flavorful, and I'm not opposed to cheesy spread. The meat was tasty in places, but flabby and fatty in others. The cheese was some kind of triple cream, unremarkable but not bad. Later in the evening, the sandwiches were replaced by smoked salmon and cream cheese on a fluffy naan-like bread. The bread was actually really soft and good, the smoked salmon fine. The next night, the cheese was chunks of Swiss. It was ... fine. Nothing special. Sandwiches were again the sundried tomato bread, cream cheese spread, and meat sandos, plus a new addition, on dark rye bread. The filling seemed to be cream cheese with nuts? Another tray of the same sandwiches was alongside some slices of tart. There were 3 types, and of course I tried them all. The first one had slices of almonds on top. I expected this to be the best. It was ... odd. It seemed to have ginger in it? My second favorite. The next one was a real surprise. It was ... mandarin orange. So weird, my least favorite. Finally, apricot. Soft, sweet, decent enough apricots on top, glazed. All three had the same base, like a soft cake crossed with a cookie. Kinda hard to explain. Not quite a tart shell, not quite a cake. The crust was decent, it tasted a bit like a shortbread cookie. But overall, clearly, these were not good. 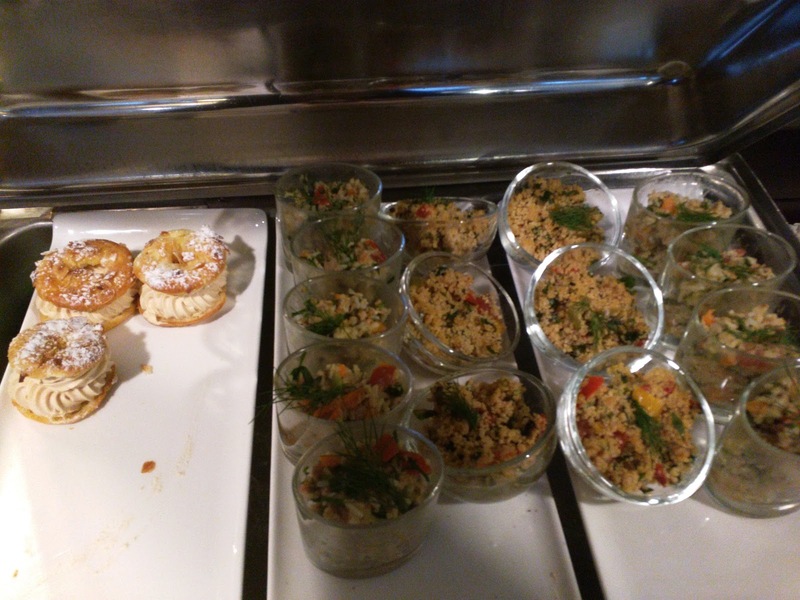 Night #2: Paris Brest, Tuna Rice, Cous Cous. The next night, the dessert was mini Paris Brest. I was fairly excited about these, not that I like Paris Brest that much, but, well, they are so French! They were ... not very good. The pastry was the real problem, incredibly soggy. This is not an item that should be soggy. It also was just a fairly thin cookie, not an airy choux pastry. The chestnut cream filling was ok though. Later that evening, the paris brest were replaced with cream puffs. The puff wasn't soggy, but it was eggy in the way that I don't like choux pastry. The filling was sweet cream, not pastry cream, almost mascarpone tasting perhaps? Decent. The other two items looked the same, until I looked closely and realized one was cous cous and one was rice. I didn't try the cous cous. The rice one had flaked tuna in it, along with some veggies, and, just like the pasta from the previous night, it was very oily. Later on the first night, additional desserts were brought out. They were ... fruit covered in strawberry sauce? The fruit was actually fine, although I guess hard to really evaluate given that they were absolutely coated in the sauce.